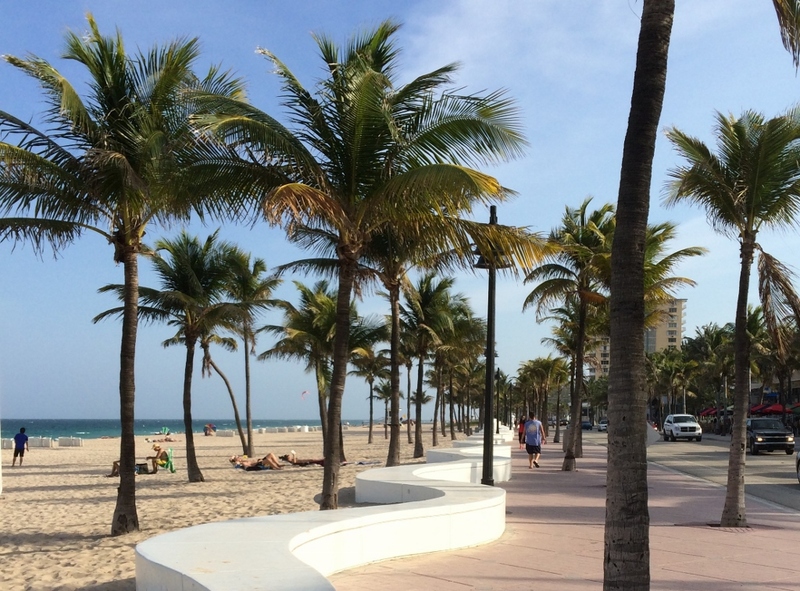 In the late 1980s, the beachfront of Fort Lauderdale, Florida, was vastly transformed when the 2-mile-long Wave Wall and Promenade were built, in addition to the redesign of coastal Route A1A to include planted medians and bike lanes. 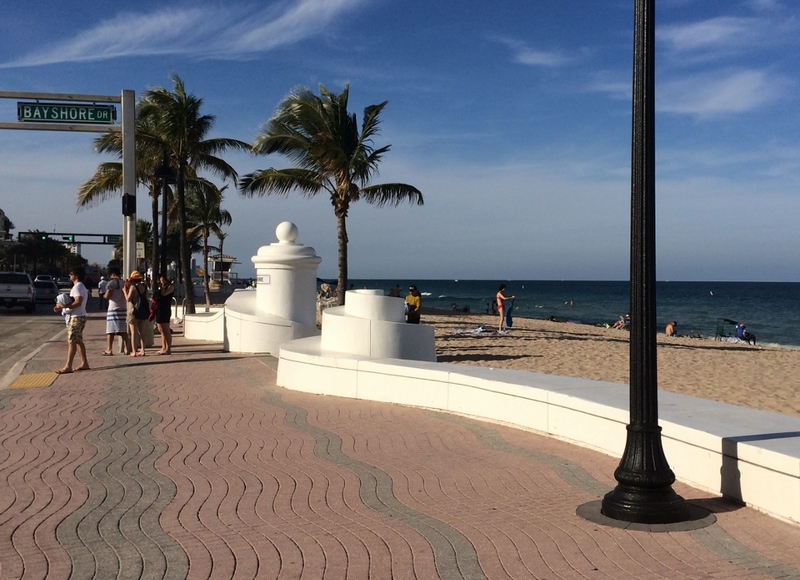 This streetscape improvement project was designed by EDSA, a Florida-based landscape architecture firm. 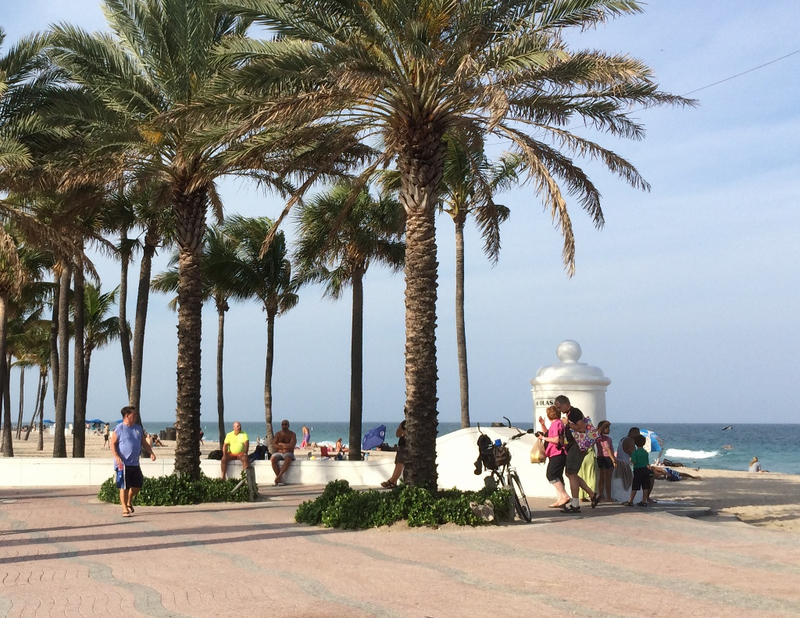 I visited the beach in April, and enjoyed my walks along this promenade. 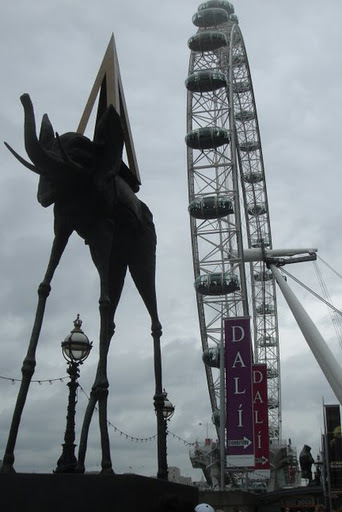 I was impressed not only by the design, but also by how well it has held up over the decades. 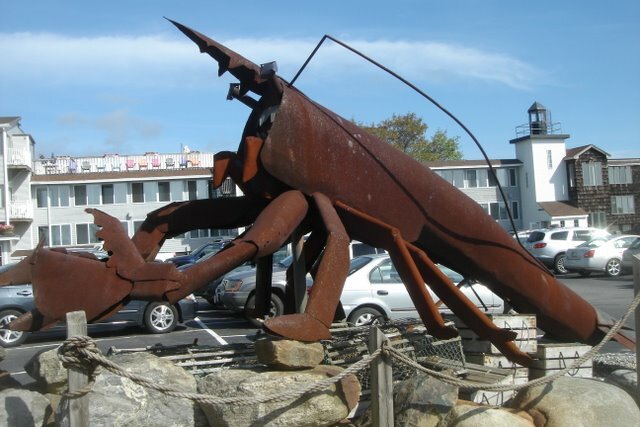 During my recent travels, I have seen a number of notable walkways along waterfronts, beside city streets, and through urban and suburban parks. 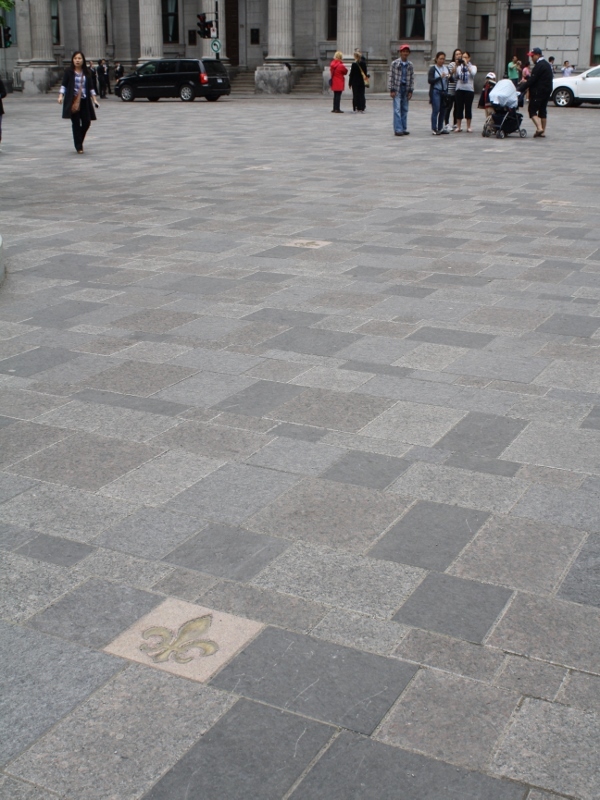 Well-designed pedestrian ways have ample width for movement and social interaction, and include visually-unifying elements throughout, such as a continuous paving pattern and repeated furnishings and plantings. 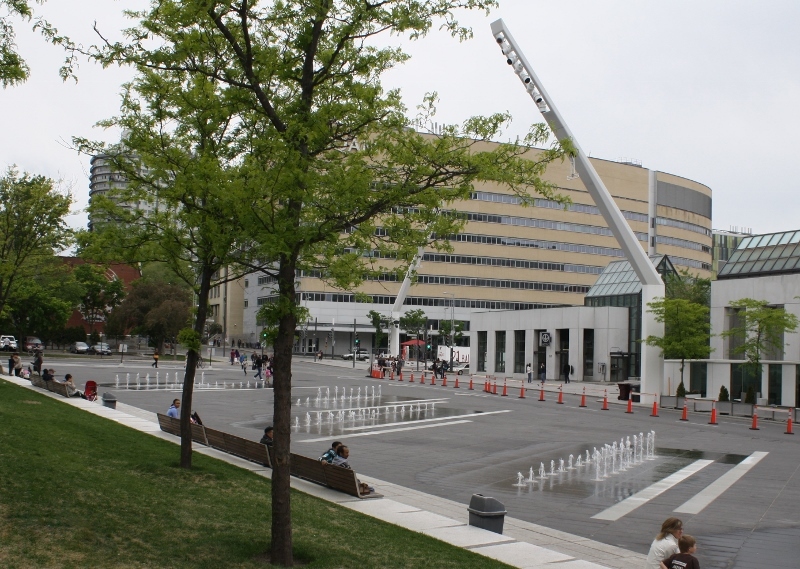 These promenades should also be designed to correspond with the character of their surroundings, as well as provide a pleasant and safe experience for pedestrians. 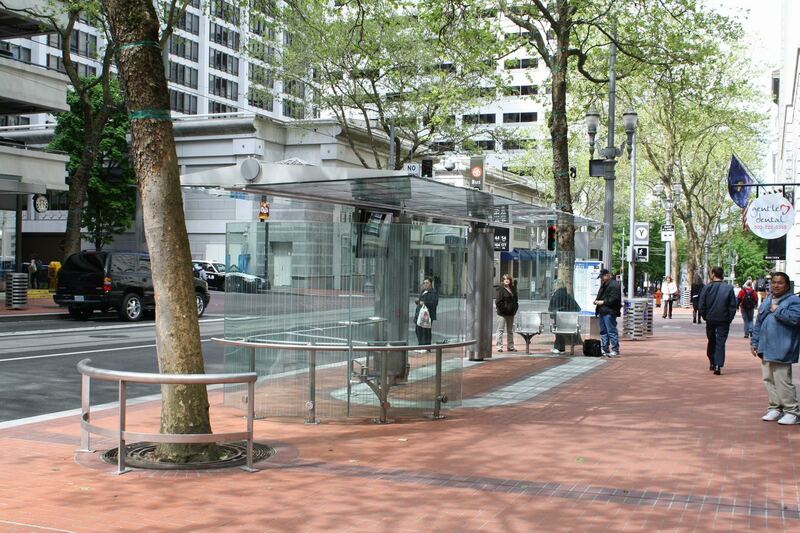 The transit mall in downtown Portland, Oregon, has wide sidewalks with decorative pavement, beside streets that have traffic lanes reserved for light rail and buses. 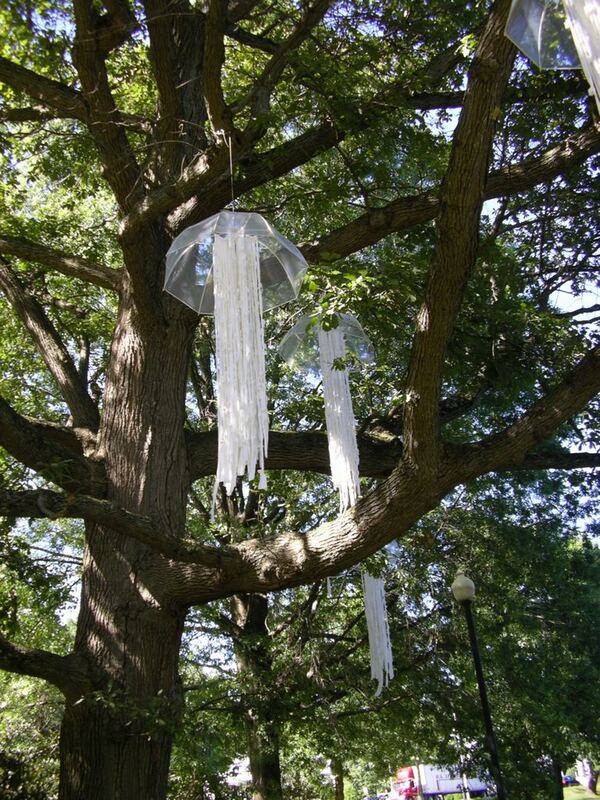 The walkways include these attractive clear transit shelters. 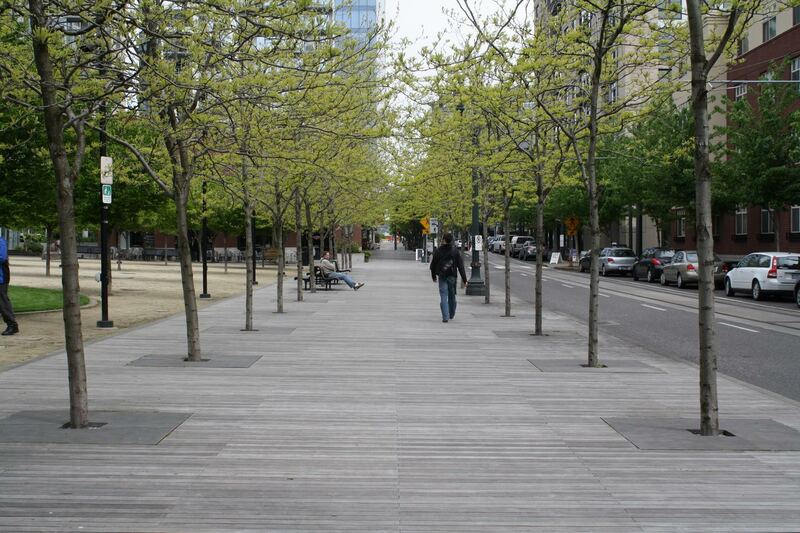 A boardwalk runs along NW 10th Avenue in Portland, Oregon for 4 blocks between two parks. It’s unusual to see a wooden walkway along an urban street. 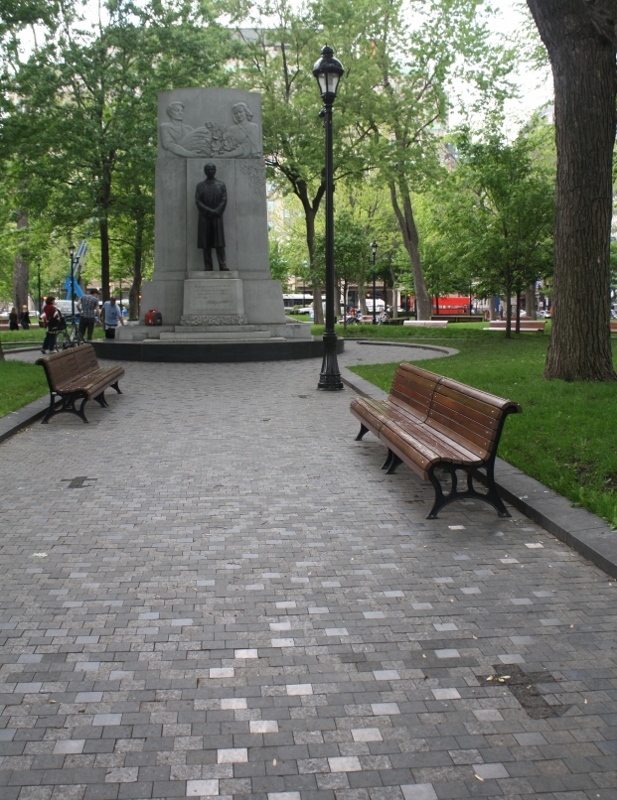 This section, which is adjacent to Jameson Square, is wide enough for a double row of trees – a pleasant place to take a stroll. Fayetteville Street in Raleigh, North Carolina, was turned into a pedestrian mall in the 1970s, but the street was added back in 2006 along with these wide sidewalks with decorative planters, benches, lights, and other features. This corridor’s revitalization is reported to be a success in terms of bringing in more business. 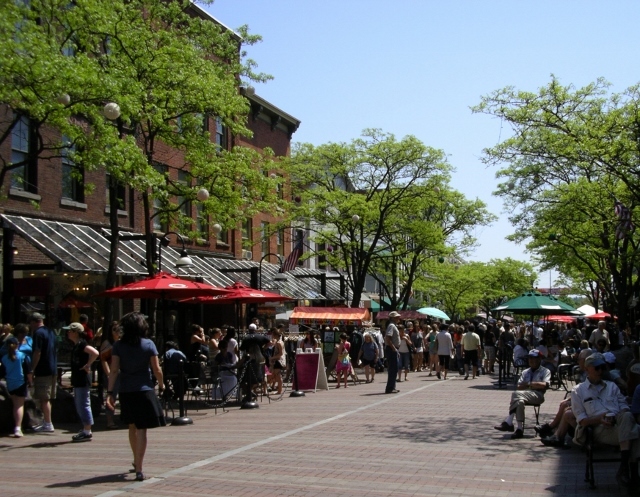 The Church Street Marketplace, in Burlington, Vermont, has been in place since 1981, and is one of the few continuously successful pedestrian malls in the U.S. 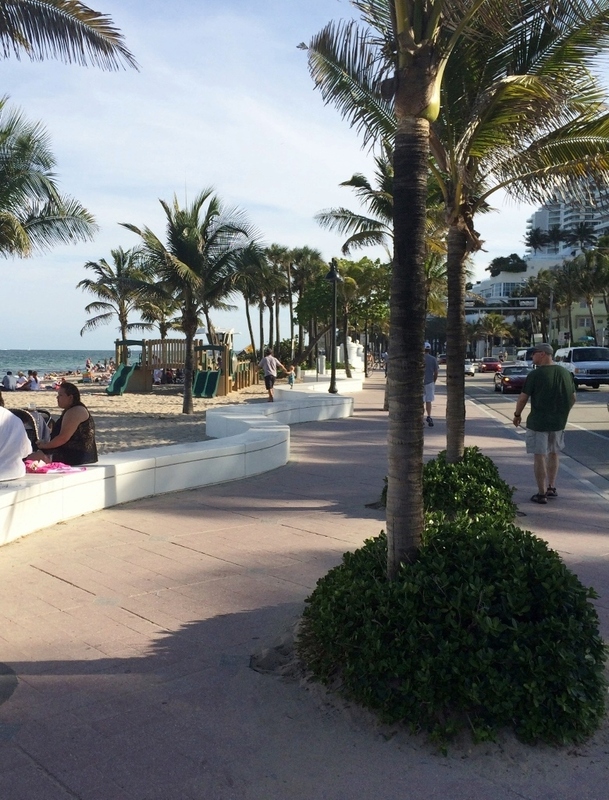 This lively promenade is full of retail stores and restaurants with outdoor seating areas. 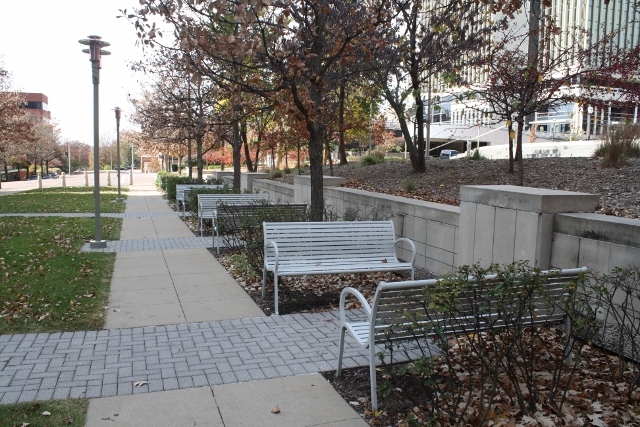 This park in Clayton, Missouri, includes a linear lawn space extending between two streets, bordered by two walkways. 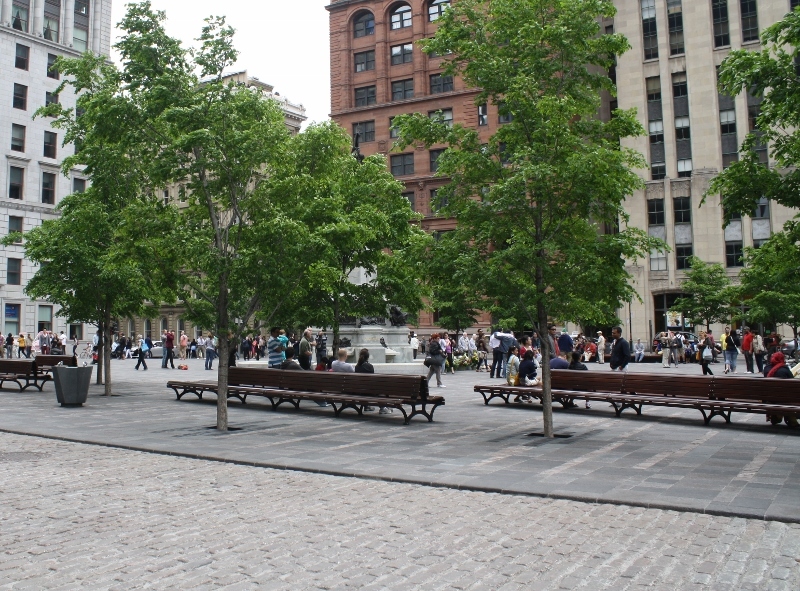 Seating areas and plantings line the edges of the promenade. Not many people were outside on this cold day in late October. 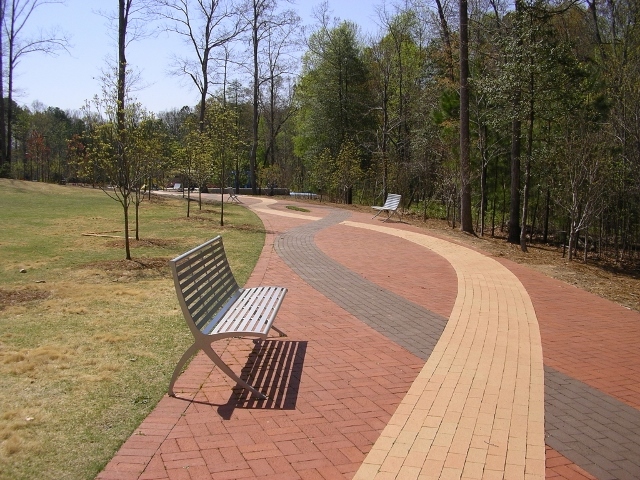 This beautifully-patterned brick walkway winds its way through Walnut Street Park in Cary, North Carolina. 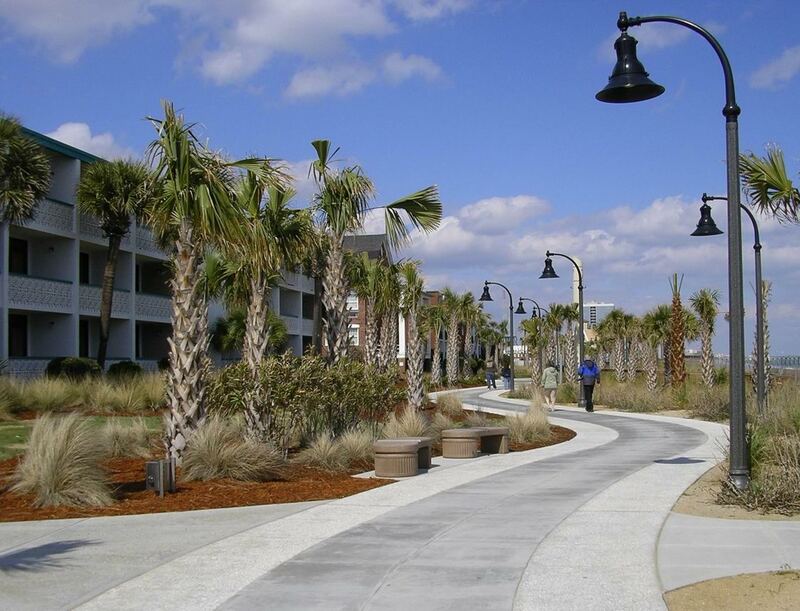 This curvilinear promenade runs along part of the ocean in Myrtle Beach, South Carolina. 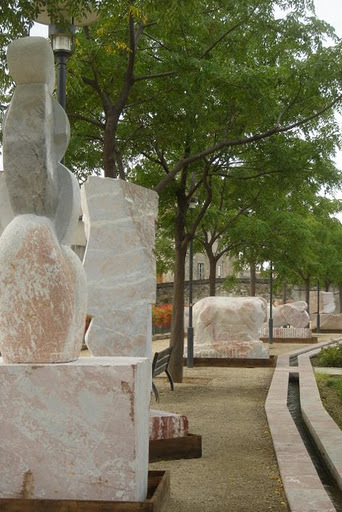 It is surfaced with concrete in contrasting colors and textures. 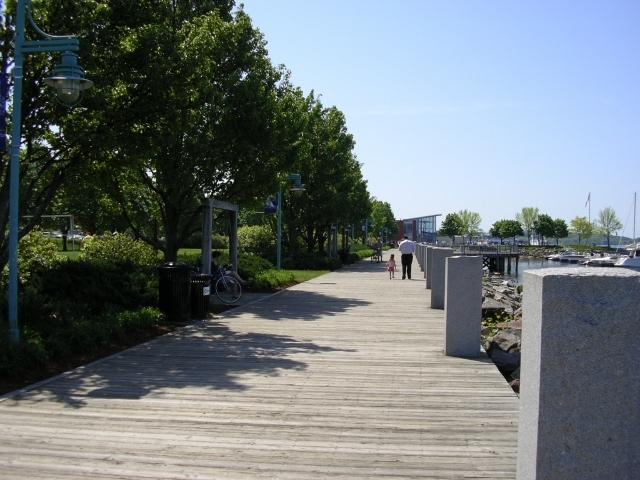 Waterfront Park in Burlington, Vermont, is bounded by a boardwalk which includes nautical-style lighting, granite bollards, and swinging benches. 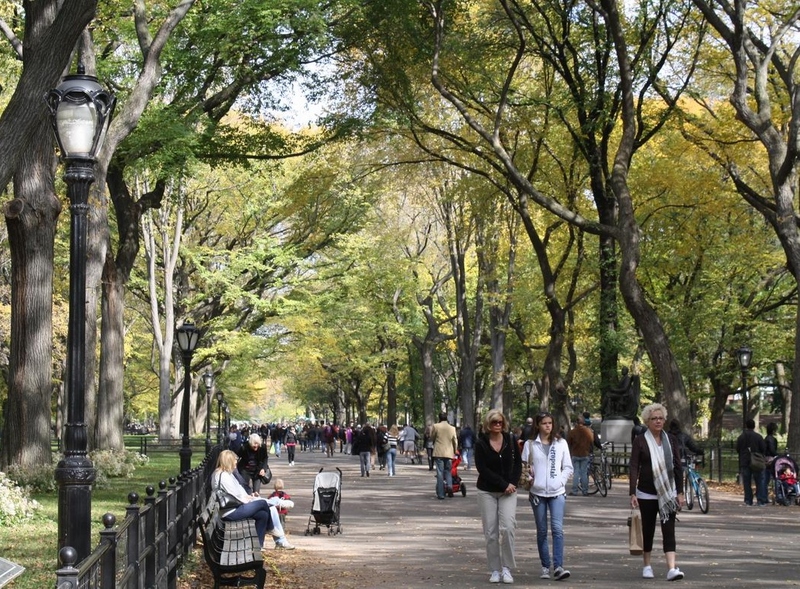 The Mall in Central Park, New York City, is an example of a historic promenade with lovely old trees. 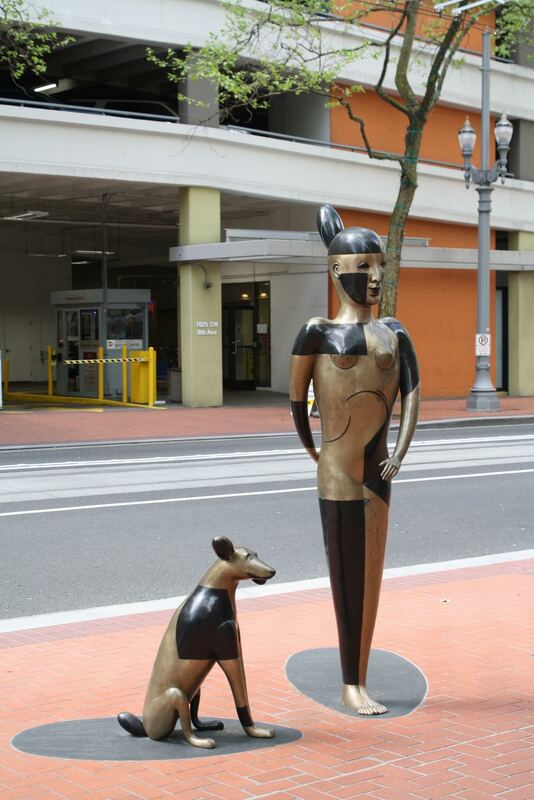 I love to see art pieces in public spaces – they often liven up a place and generate conversation. 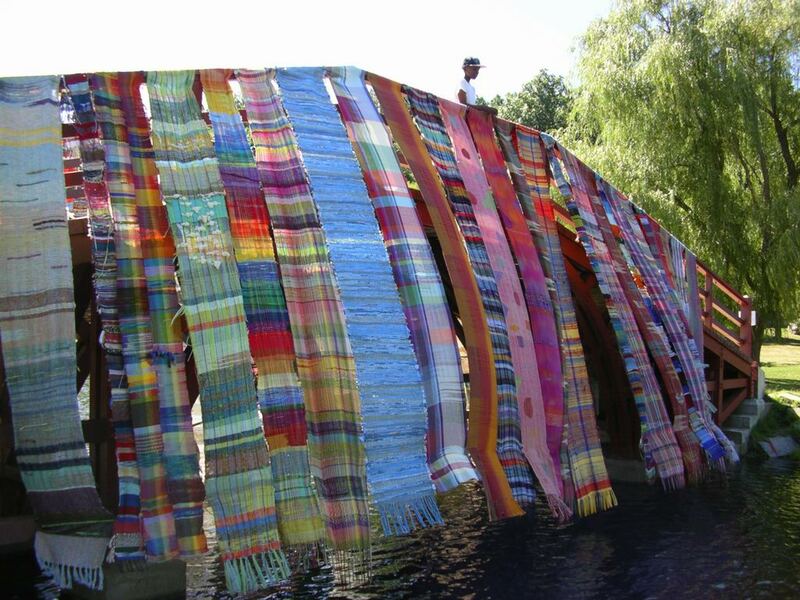 Below are a few interesting installations found in the U.S. and Europe, both permanent and temporary, in quite a range of styles and materials. 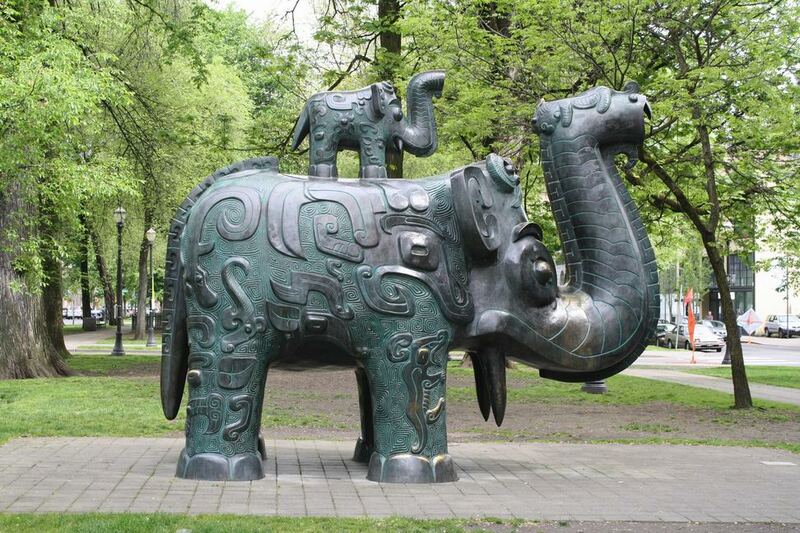 Portland, Oregon, is known as one of the greenest cities in the U.S., receiving high marks for public transportation, bicycle/carpool commuting, renewable energy usage, recycling, and number of LEED-certified buildings. 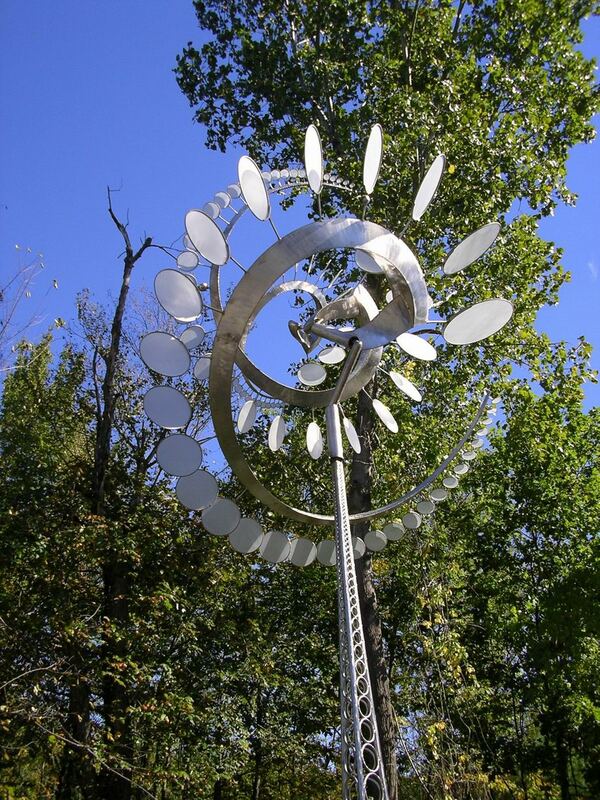 It also has quite a few innovative environmentally-sustainable sites, including several “green streets”. 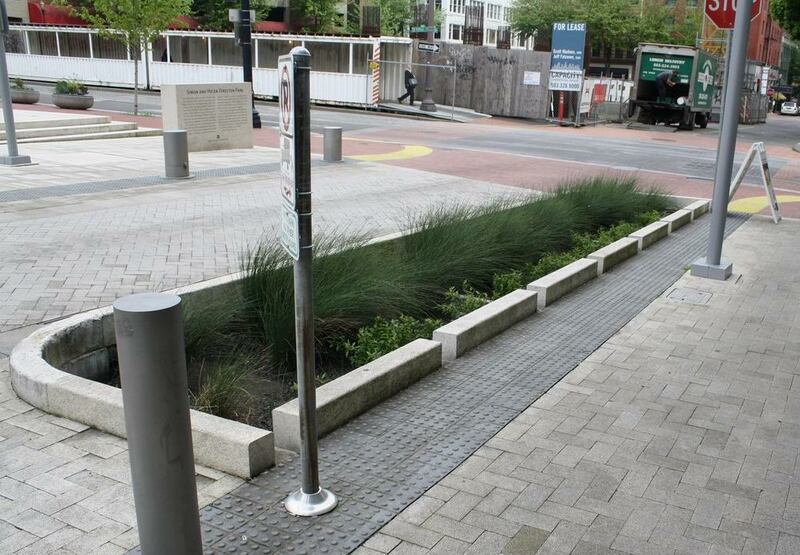 These streetscapes incorporate special planters that decelerate runoff and filter pollutants from the water before it reaches the storm pipe system. 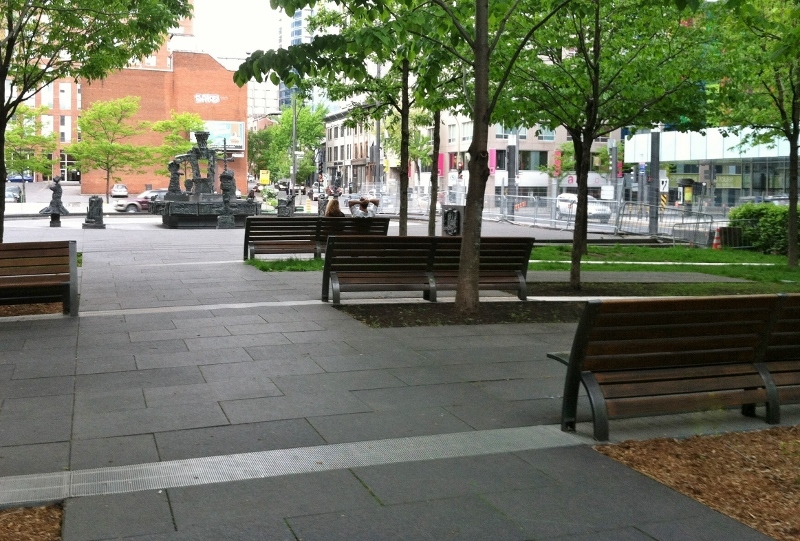 During a recent visit to Portland, I had the opportunity to see a couple of these green street projects in the downtown area: one on Southwest 12th Avenue within Portland State University, and another on Southwest Park Avenue across from Director Park. 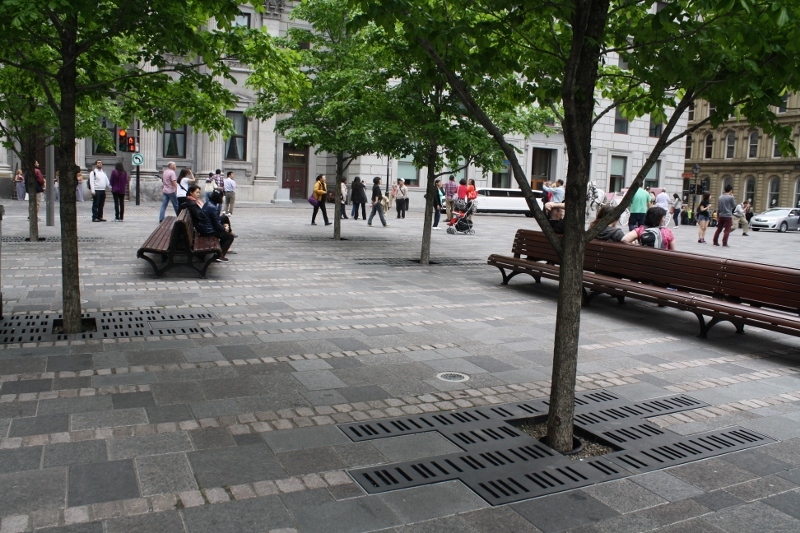 There are several other green streets scattered around the city, and many of these have their own unique design. 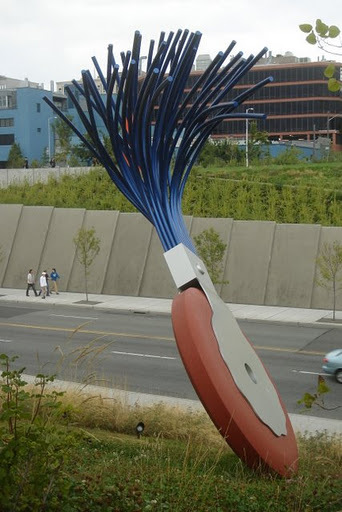 The 12th Avenue site was the first of its kind, built in 2005. 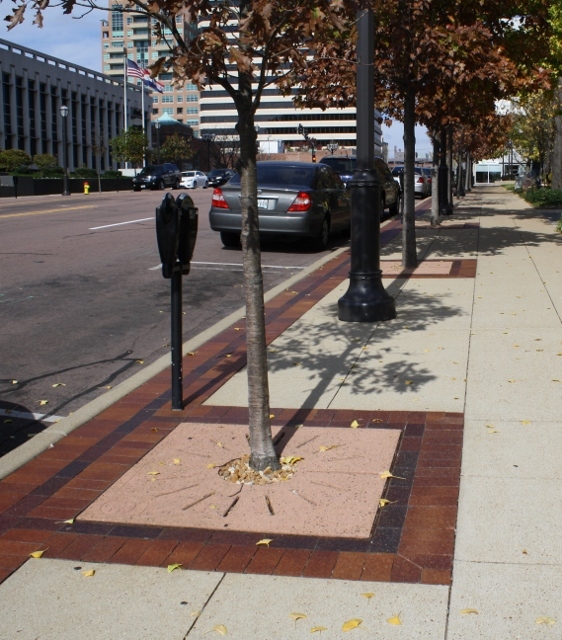 In addition to its stormwater management function, it has enhanced the visual quality of the existing streetscape. 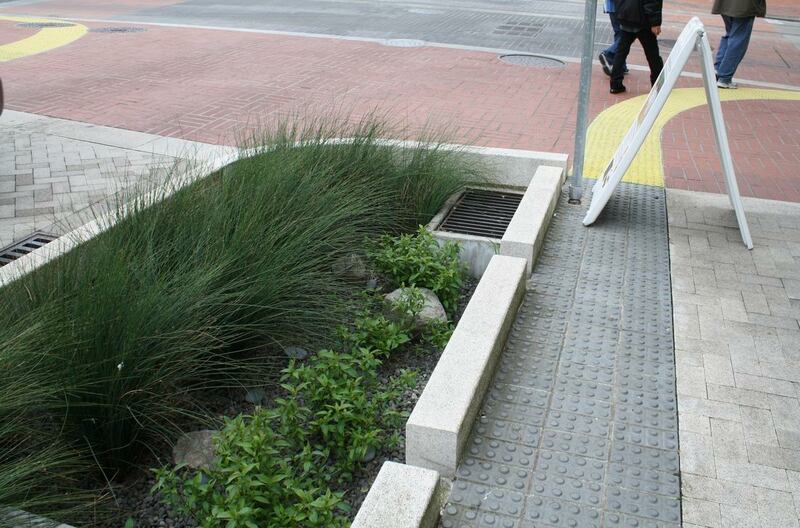 In this case, stormwater flows into the first of four planters, and settles into the soil. During heavy storms, if the water level in this planter reaches more than 6 inches, the excess amount will flow back out into the gutter and then flow into the next planter for infiltration, repeating the process. Water exceeding 6 inches height in the last (lowest) planter will flow out to the street and enter the storm drain system. The number of planters functioning in this manner depends on the intensity and duration of each rain event. 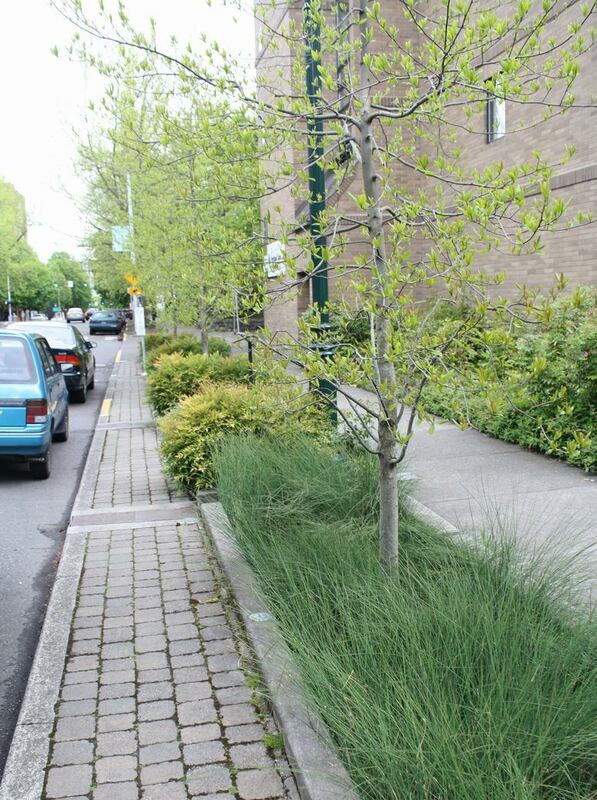 The planters are filled with a native species called Grooved Rush (Juncus patens), and each also includes a Black Gum tree (Nyssa sylvatica). Both of these species tolerate saturated soil conditions. 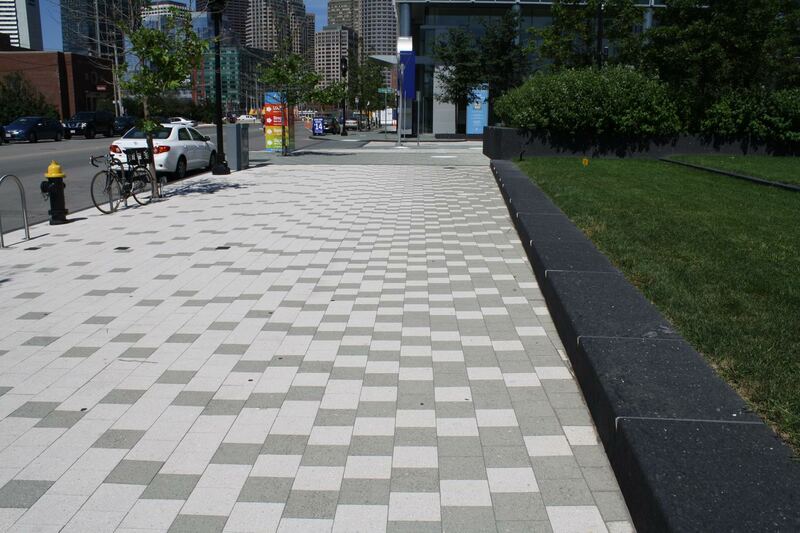 In addition, a 3’-wide strip of pavers is located along the street side, providing space for access to parked cars. 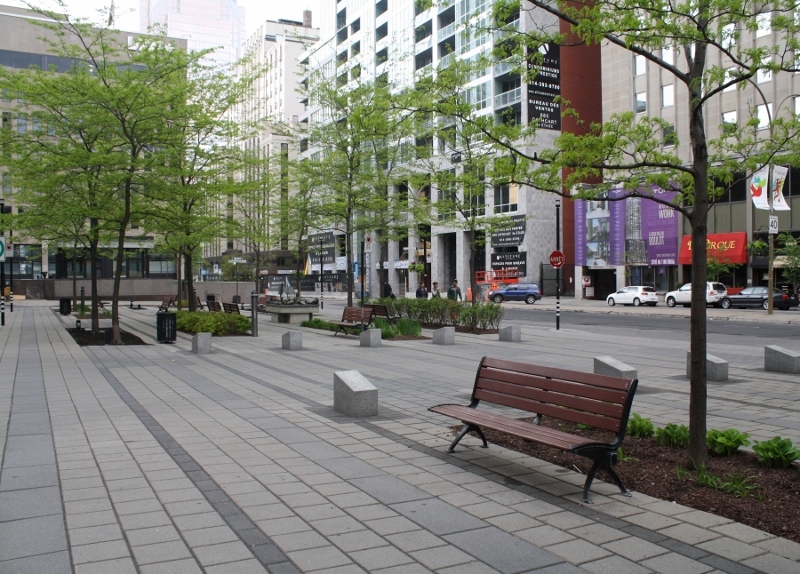 Pedestrian walkways are also situated between the planters, bounded by small shrubs. 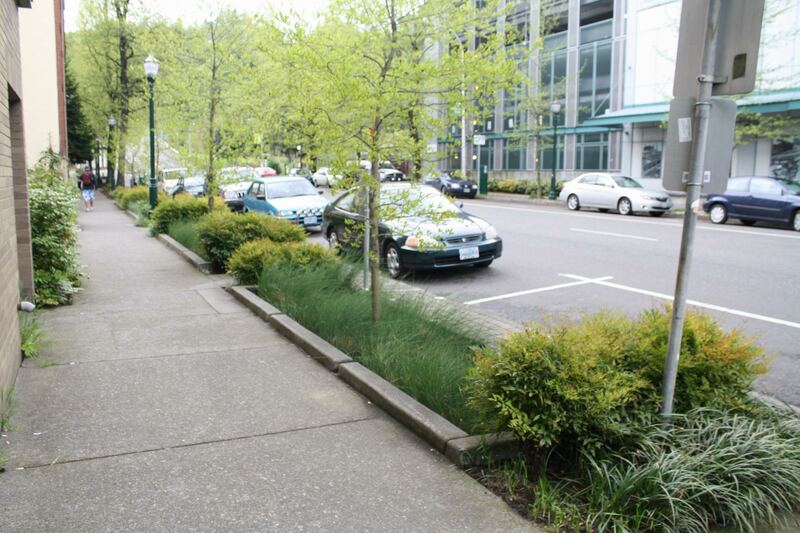 The Southwest 12th Avenue planters include a strip of pavers for parked vehicle access. 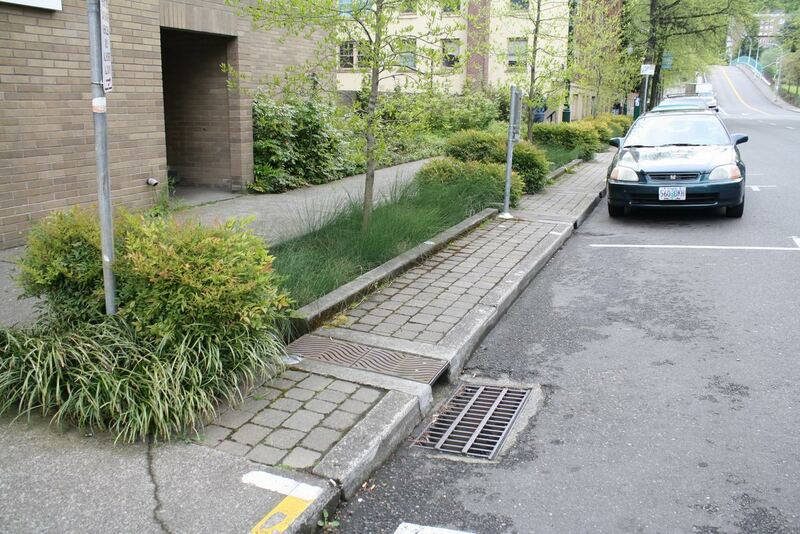 Excess runoff from the lowest planter enters the storm drain system. 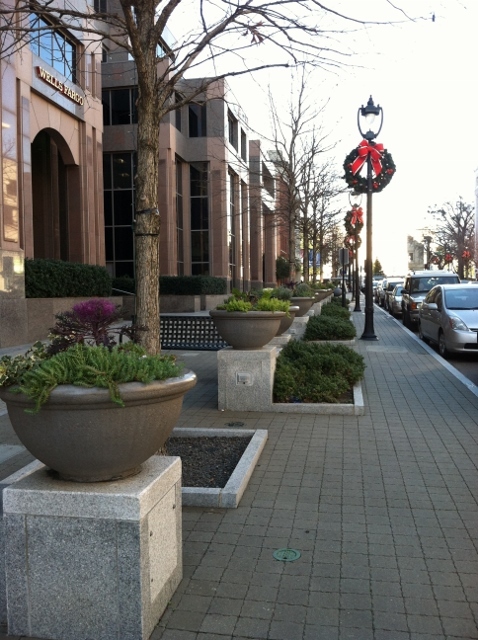 The planters and vegetation fit nicely into the urban streetscape. 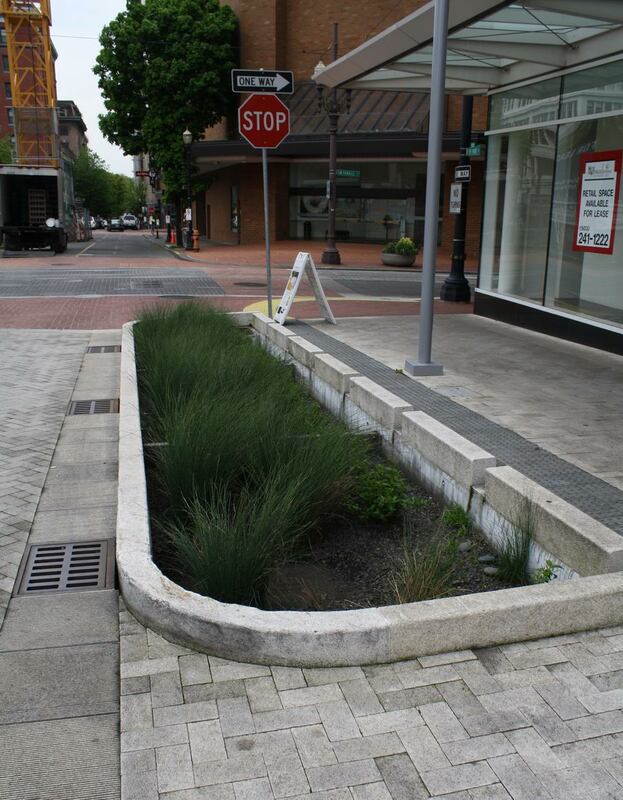 Each street-side planter inlet includes a small hump in the asphalt to direct water into the planter. 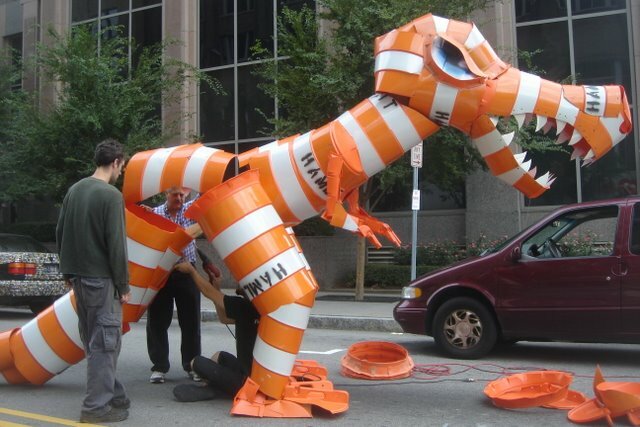 The planters on Park Avenue are designed in a different manner. 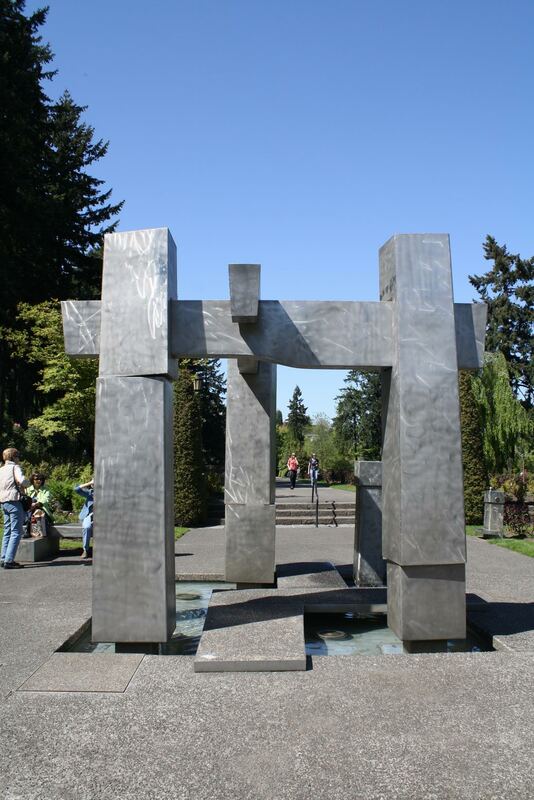 The largest planter (pictured below) is divided into three sections. 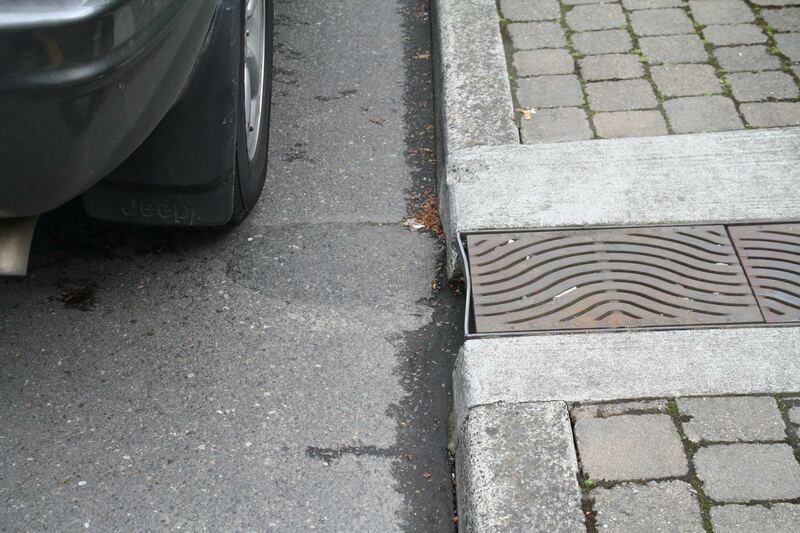 Water enters the planters from drain inlets along the street side, and from gaps in the curbing along the sidewalk. When water in the highest planter section exceeds the height of the divider during large rain events, that runoff will flow over the divider into the next section. Most of the water will filter into the soil in the planters, but during the heaviest storms it may reach the third (lowest) planter section. If the water level in this section reaches the height of the elevated drain inlet located within it, this excess water will enter the inlet and flow into the storm pipe system. 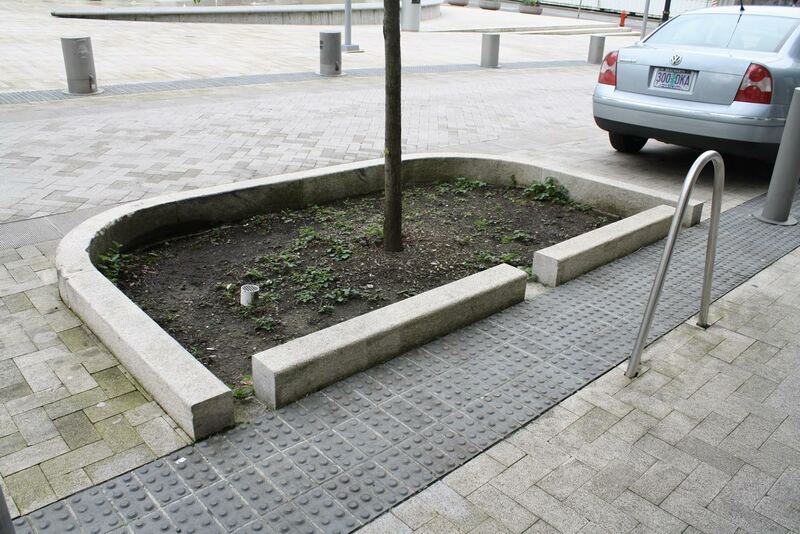 Gaps in curbing along the sidewalk receive runoff. 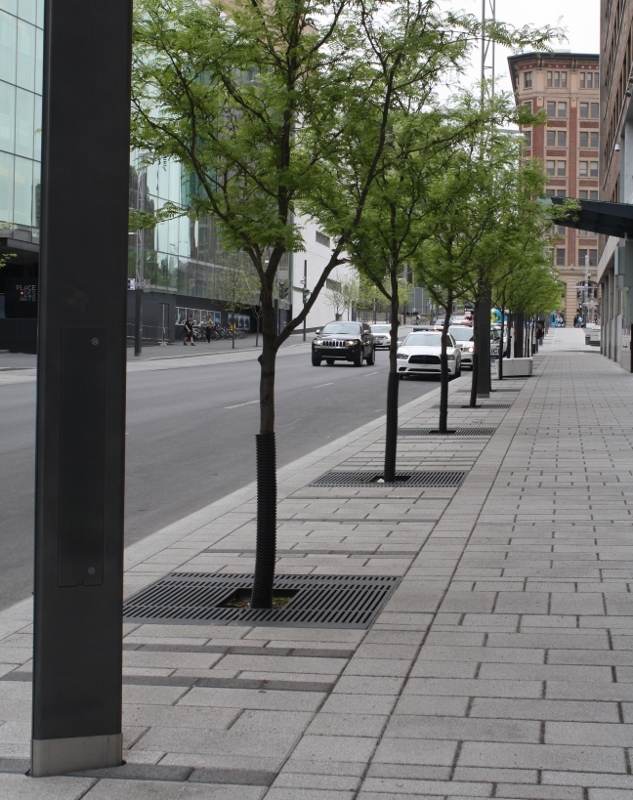 One of several individual tree planters along Southwest Park Avenue only receives runoff from the walkway side. 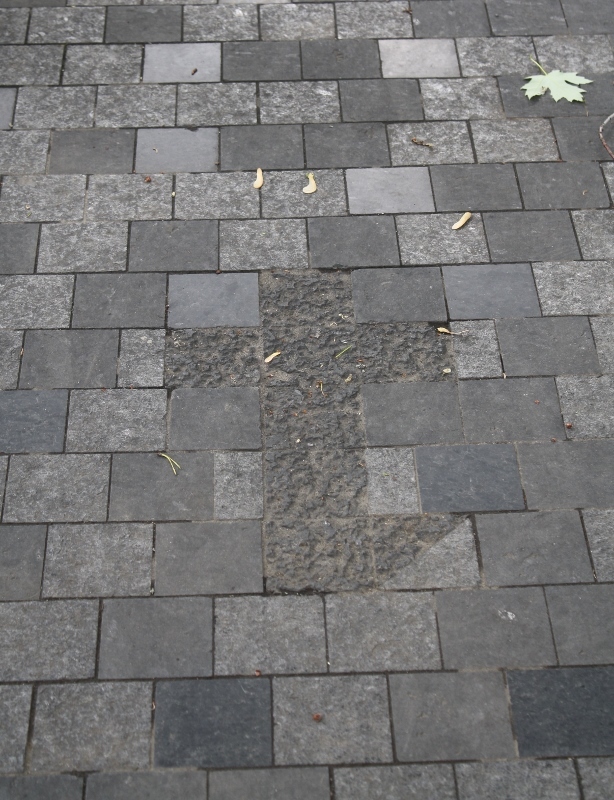 A small raised drain in the planter takes in excess water during heavy storms.